after converting my Geo-Database from Long Raw (SDEBINARY) to st_geometry, i found out that i can only see the feautre classes (layers) through schema accounts ONLY in ArcCatalog !!! since we follow strict security implimentation on the Oracle Databases, we have revoked many ‘PUBLIC’ role permissions in ArcSDE Geodatabase Systems, and it seems these permissions are required. 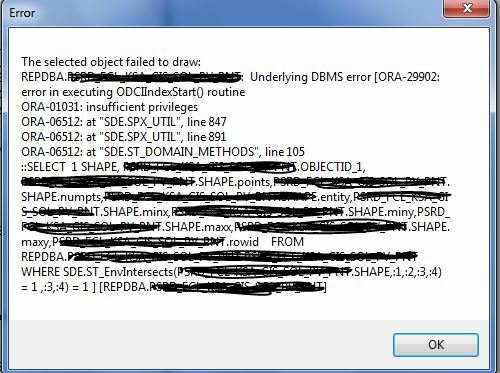 arcgis ORA-01031, esri Underlying DBMS error[ORA-29902: error in executing ODCIIndexStart() routine, line 105, line 847 ORA-06512: at "SDE.SPX_UTIL", line 891, ORA-06512: at "SDE.ST_DOMAIN_METHODS", st_geometry ORA-01031: insufficient privileges, st_geometry ORA-29902, Underlying DBMS error[ORA-29902: error in executing ODCIIndexStart() routine ORA-01031: insufficient privileges ORA-06512: at "SDE.SPX_UTIL"